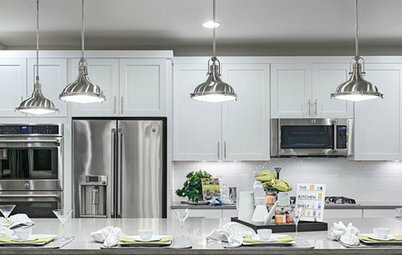 Anyone who has built or remodeled a kitchen will tell you how easy it is to become overwhelmed. You may go into the experience thinking, “Finally, I get to have things the way I want,” only to discover how stressful it can be balancing your wishes with practical concerns and, perhaps most important, a budget. It’s a lot. 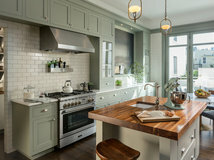 One choice that seems to be particularly difficult is countertops. 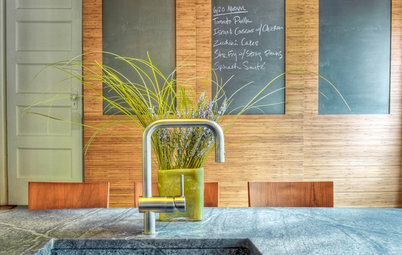 There are many featured Houzz ideabooks covering the pros and cons of various counter materials, but today I’d like to focus on soapstone. 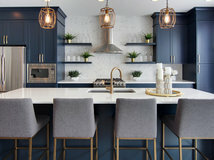 If you are weighing whether or not soapstone is a good choice for you, you’ve probably already decided you like the look and that it fits your budget, and now you’re navigating the practical concerns. Are you surprised and alarmed how tricky this part is? 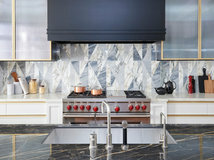 You may have learned there are two camps: those who hate their soapstone counters and rue the day they ever heard of the material, and those who love! Love! Love! 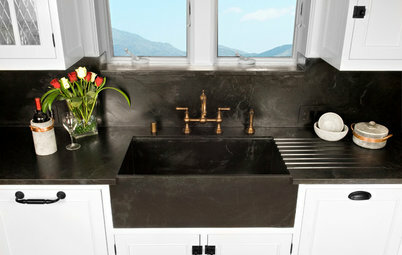 soapstone so much, they spend hours draped on their countertops, stroking them gently. OK, I’m exaggerating … a little. Since the camps are so divided, you would think it would be easy to figure out your side. Unfortunately some people think they’re in the love camp only to live with their counters a few months and realize they are going insane. For the sake of everyone’s mental health, I’d like to go over a few things to consider before you make your decision. Full disclosure: I’m in the love camp. 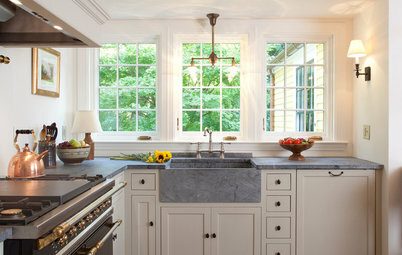 One of the things I most love about soapstone is its beautiful and timeless appearance. 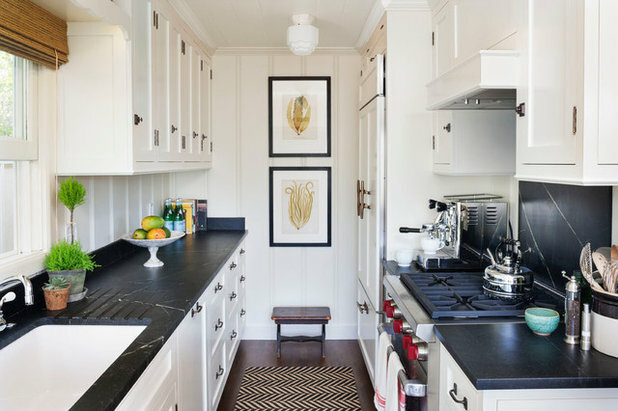 People worry about fads, and while soapstone is a very popular choice right now, there’s no need to worry about its being a trend that will date your kitchen, because it’s a classic. 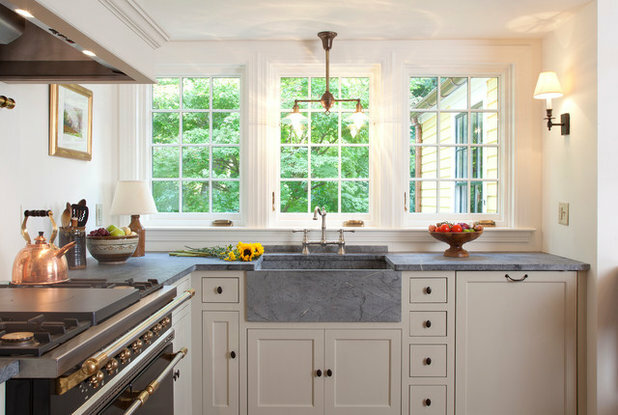 Soapstone has been used in farmhouse kitchens for hundreds of years. 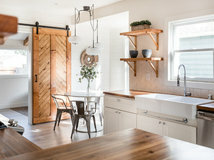 It’s frequently seen with white cabinets in traditional and farmhouse kitchens, but it looks equally stunning with stained wood in various styles. Here it is looking just right in a more modern setting. 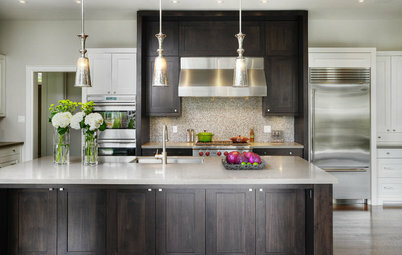 The counters have been left untreated, making a pleasing contrast with the black cabinets. 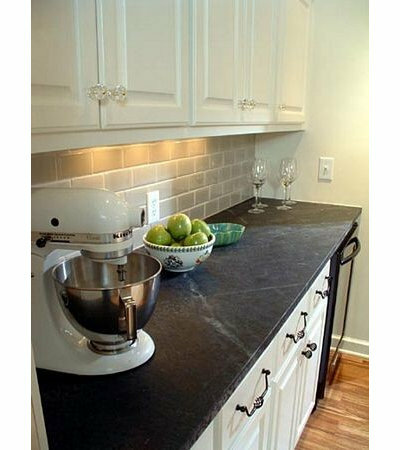 Soapstone’s changeability is it’s biggest attraction or detraction, depending on your perspective. 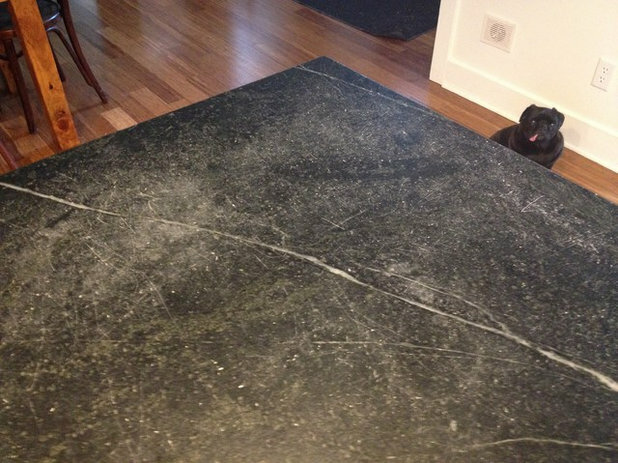 This is what soapstone looks like before it’s oiled, and many people love the look. If you do, you can leave it just like this. This counter has also been left untreated. You can see darker patches in front of the knife block; these are very common. If you prefer black, it’s as simple as rubbing on some mineral oil. Let it soak in and watch the white veining pop. How often you oil is entirely up to you. 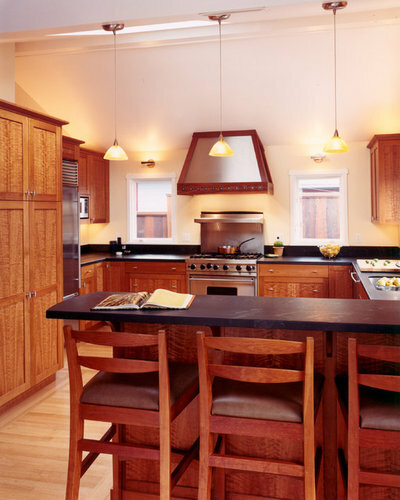 Some homeowners do it routinely; others go years between applications. 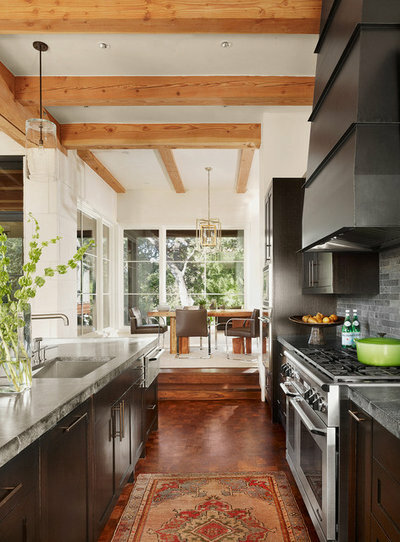 This counter appears to be freshly oiled, but look at the corner of the sink and you’ll see a couple lighter areas. 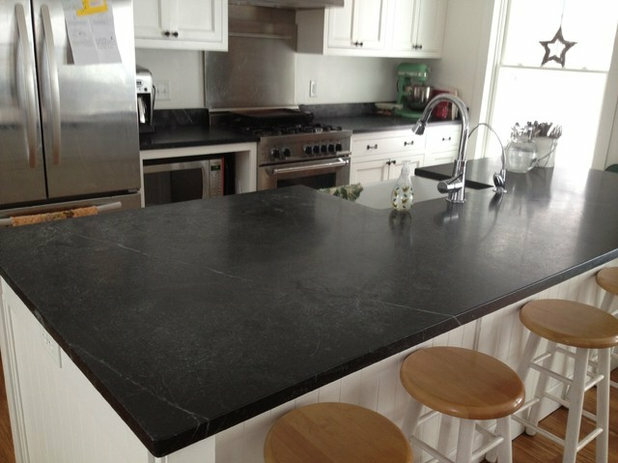 If you are feeling the urge to rub those spots out, that’s a sign soapstone probably isn’t the best choice for you. Another area of concern is durability. 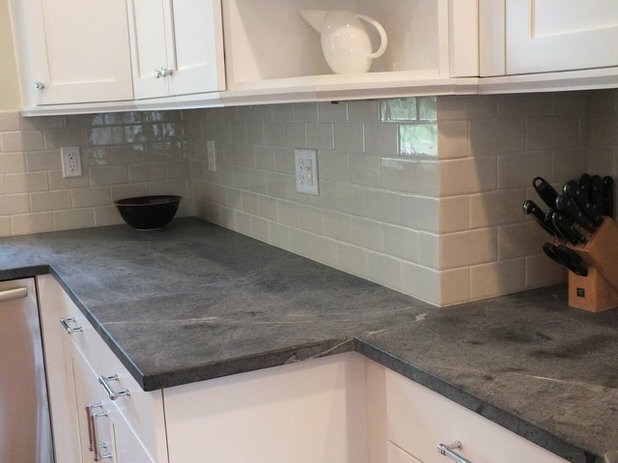 On the one hand, soapstone is very strong. It’s wonderful being able to set hot pots and pans right on the counter. On the other hand, it is a softer surface. 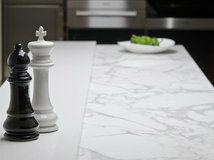 The question isn’t if soapstone will scratch, but when. This is my own kitchen. In three years I have oiled the counter only twice. The first time was a few months after we moved in, and the second was six months ago. There are five people in our family, and all of us are in here banging around, cleaning up every night. My kids eat at the island every morning, and somehow I use every counter, every single day. I cook with cast iron, and our plates are very heavy. When we entertain it’s usually a crowd. 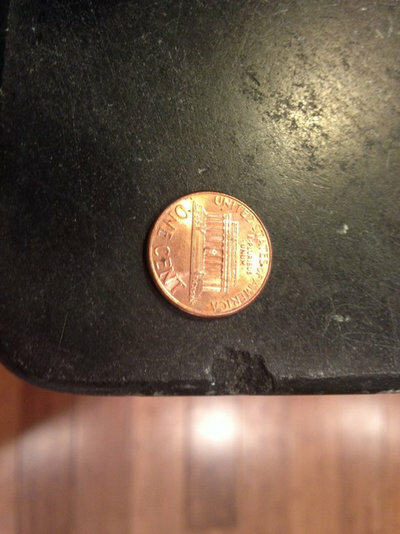 Short story: Our 3-year-old counters have gotten a lot of wear and tear. There are scratches everywhere, a few gouges and a couple of chips on the edges. 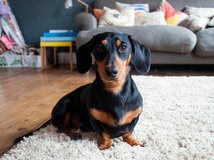 I’ve taken a few close-up photos to give you an idea of what to expect. 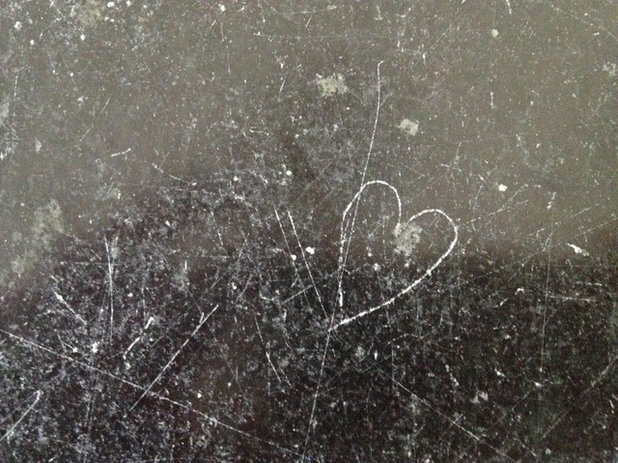 This is the counter to the left of our stove. Our coffeemaker lives here and is pulled in and out a couple of times morning and night. I do some food prep here, and some shorter children have been seen climbing on this counter to reach hot chocolate and mugs in the cupboards above — not that that’s allowed. 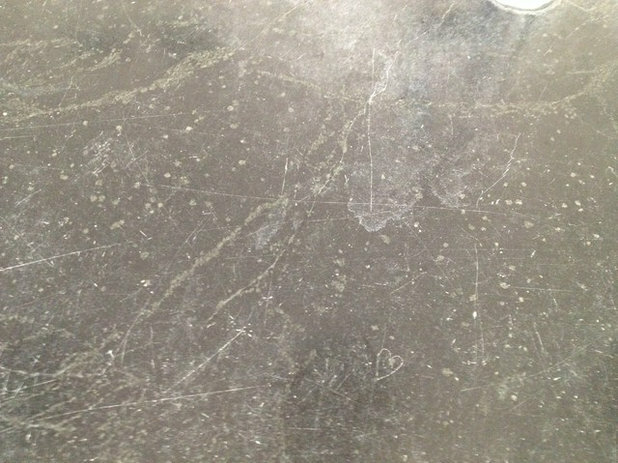 You can see the natural white veining of the soapstone; the more circular white spots are gouges. They aren’t particularly large or deep, but I feel them when I wipe the counter, and they do bug me a little. I could probably sand them down but haven’t taken the trouble. This chip is on the corner of my island, possibly the busiest spot in my kitchen. This is where all the plates are set when we load and unload the dishwasher. The chip isn’t terribly large. Other than close up, you can barely see it, but whenever I feel it, it does bother me. 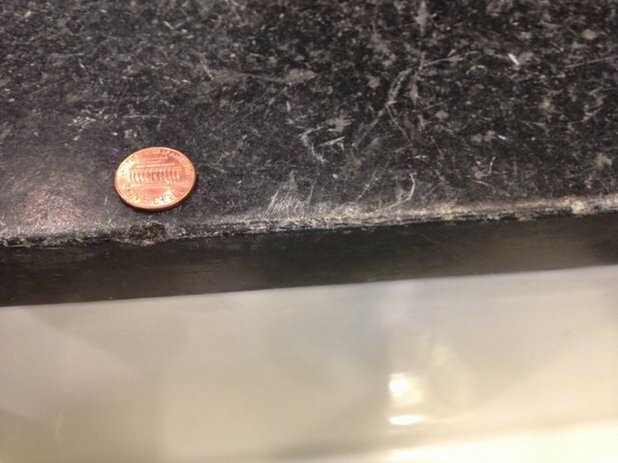 Here’s another chip on the edge of my sink. It’s a very busy spot above the dishwasher. Note also the whitening from intense scratches. 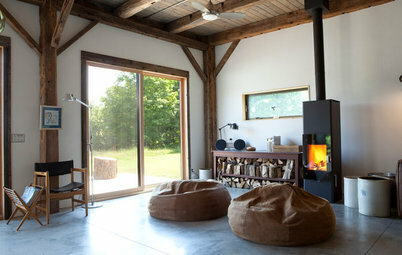 This is the opposite corner of the island and a popular landing place as we come in from the mudroom or the front door. Note the discoloration on the left side. There are similar markings around the faucet, but I think I’m the only one who notices them, and even then only when all the lights are on. A quick oiling would take care of them. If discoloration and markings bother you, you probably will need to oil more frequently. 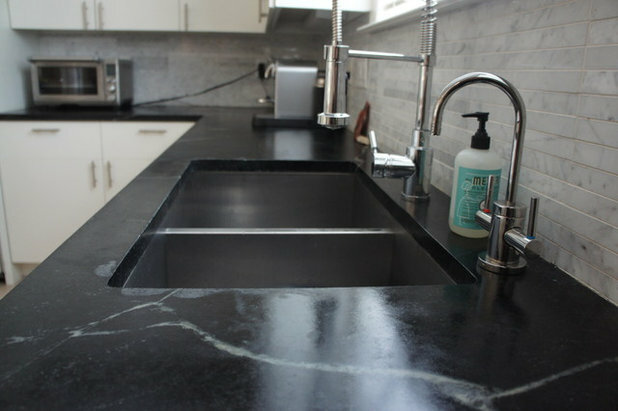 If you’re telling yourself that constant oiling could keep the counters free of these markings, I recommend you think very carefully about installing soapstone countertops. They will never be perfect, but that’s exactly what those of us who love them most appreciate. We call it character. Even so, as I said, the chips and gouges do feel like imperfections. But everything else balances out in favor of soapstone, and I couldn’t be happier with my choice. 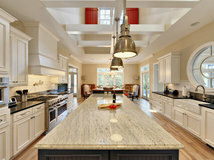 Here’s the front of the island, by the bar stools. Note the discoloration from the faucet at the top and scratches all over. And what’s that toward the bottom, just right of center? Is that a heart? Yes it is. 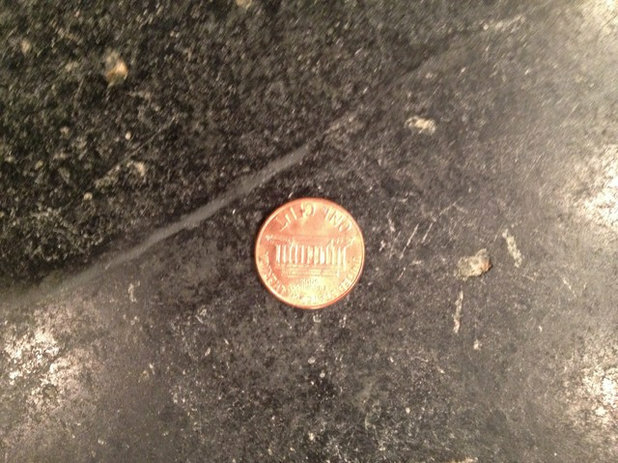 A child mindlessly scratched this while eating breakfast one morning and then lived in horrible suspense until, weeks later, I finally noticed it. I have been known to fly off the handle a time or two, but I took this in stride. The culprit apologized nicely and offered to try to fix it. The next time I decide to oil, I’ll have her do the job, and it will probably disappear. If that doesn’t take care of it, the lightest sanding would. I’m not worried, because 1. I love the child who made it, 2. I like hearts and 3. 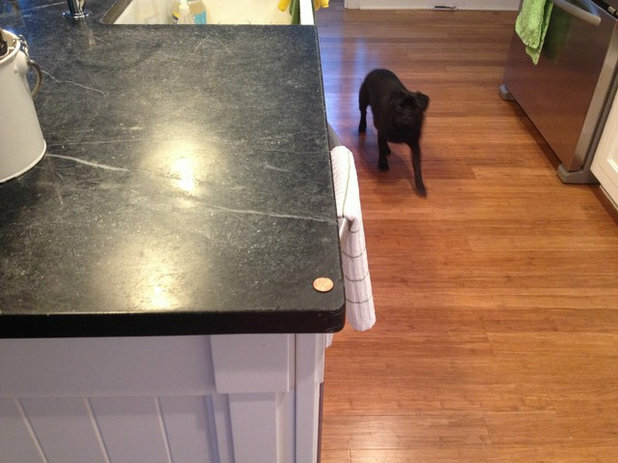 It’s almost like it’s a little symbol of how much I love my soapstone counters. 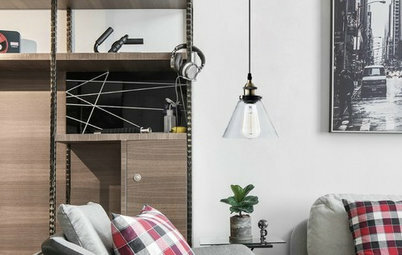 Punky Hill Invisible Shelf Bracket for Floating Shelf Appearance, 4"
As w/ any stone, no.trivets needed. 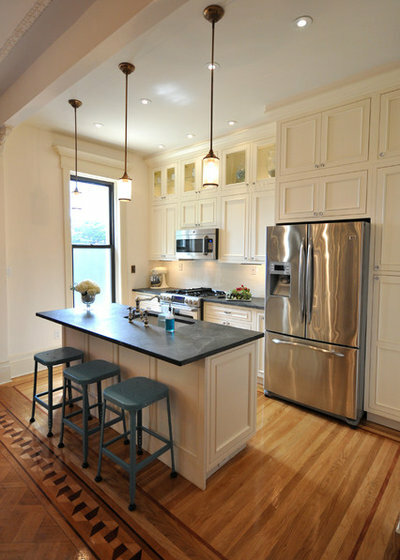 I had soapstone in 2 previous kitchens but went with marble (homes & leathered) this time. 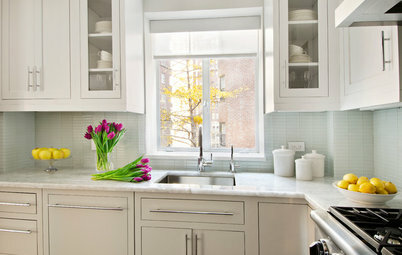 Won't do that again -- it's beautiful but much moe maintenance Soapstone is the nest !!! Stains and bacteria? Not on soapstone's watch. 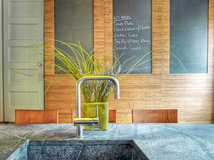 But this sink material's benefits don't come cheap.